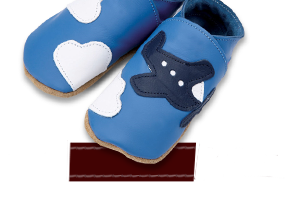 Lovebirds On Lemon, Starchild soft leather baby girl shoes. Lovebirds in pink and blue on lemon shoes. Twitter in love. Stars Taupe Baby Blue, Stars in baby blue on taupe leather baby shoes.